and-counting as one of the jazz world's preeminent tenor saxophone players is the deep passion for the music he acquired at home. His first recollections of hearing his father Lou play jazz on his tenor sax, clarinet or flute date to when he was three. As Ernie grew, his father fostered that burgeoning love of jazz by playing his favorite records for his son, and giving him his first clarinet lessons at six. By the time he was 13, Krivda was already gigging professionally in polka bars. 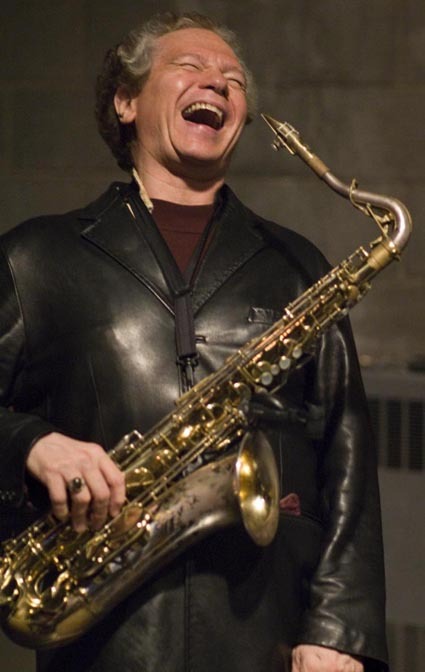 After several years of cutting his teeth in the Cleveland’s jazz scene that flourished around East 105th Street, Krivda began to play tenor sax with the Jimmy Dorsey Band under Lee Castle. The list of musicians he shared a stage with in those days reads like a Who’s Who of jazz and popular music greats. For example, while playing in the house band at the famous Leo’s Casino he supported such Motown greats as The Temptations, The Supremes, The Four Tops, and Smokey Robinson, and also played on recording sessions for groups like The Ojays and Terry Knight. In the 1970s, while leading the house band at the legendary Smiling Dog Saloon, Krivda spelled (and often sat in) with the top jazz names of the era and earned a reputation as one of the music’s leading talents. Offered a slot in Miles Davis’s group, he instead took alto saxophone great Cannonball Adderly’s advice to join Quincy Jones’s last touring band. In 1976, Krivda moved to New York and signed with Inner City Records. The series of recordings that followed cemented his position as one of jazz’s most important saxophone players. However, a few years later, Krivda moved back to Cleveland, “where I could be me,” he says. His accomplishments continued to pile up, as he wowed audiences all over the world, from Los Angeles to Vienna, from Carnegie Hall to the Kool Jazz Festival. Krivda has been the subject of features and articles in international publications such as Down Beat and Jazz Times. Additionally, he has won countless awards, most recently the prestigious Tri-C Jazz Festival Jazz Legends Award. According to Ernie, his favorite performance was his contribution to a Tribute to Stan Getz concert held at Severance Hall in 1998 that was recorded and released as part of a multiple CD set in 2003–2004. In addition to his trio, Krivda leads The Fat Tuesday Big Band, a Cleveland favorite for its raucous, high-energy jazz concerts. Krivda added teacher to his expansive repertoire when he became a charter member of the Jazz Studies faculty at Cuyahoga Community College, home of the celebrated festival.